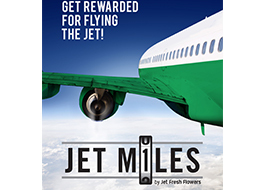 The Jet Miles program is completely free to sign up with no annual or membership fees. There are also no blackout dates, either; so you can earn Jet Miles during high-peak flower seasons to be redeemed throughout the calendar year. However, customers must sign up and be approved first.